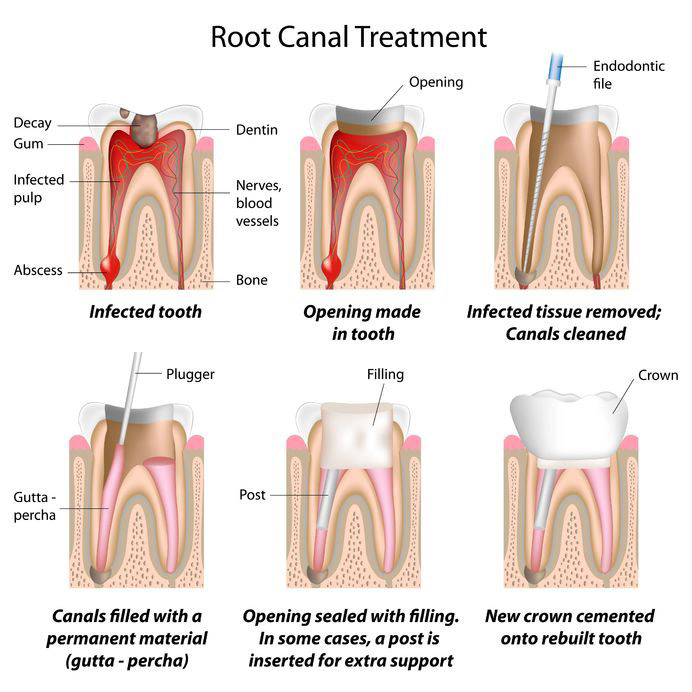 Root canal therapy is a treatment that is required when the nerve of a tooth is affected by decay or infection. In order to save the tooth, the pulp (the living tissue inside the tooth), nerves, bacteria, and any decay are removed and the resulting space is filled with special, medicated, dental materials, which restores its full functionality. Root Canal is done to save a tooth that otherwise would have to be removed. Many patients believe that removing a tooth that has problems is the solution, but what is not realized is that extracting (pulling) a tooth will ultimately be more costly and cause significant problems for adjacent teeth. Most patients who have root canal experience little or no discomfort or pain, and enjoy a restored tooth that can last almost as long as its healthy original..
What does root canal therapy involve?A root canal procedure entails one or more appointments. While the tooth is anesthetized, a rubber dam is secured around the tooth to keep it dry. A small hole is drilled through the top of the tooth and into the inner chamber to make an access. A series of root canal files are placed into the opening, one at a time, removing the pulp, cleansing the canals. The cleansed chamber and canals are filled with a permanent elastic material and medication designed to prevent infection. This will protect the tooth and prevent it from breaking, and restore it to its full function. The patient will be given care instructions after each appointment. When it comes time for you to need a filling, you can feel confident the appearance of your smile won’t be compromised. A composite (tooth colored) filling is used to repair a tooth that is affected by decay, cracks, fractures, etc. Composite fillings are usually placed in one appointment. While the tooth is numb, Dr Seth will remove the decay as necessary. The space will then be thoroughly cleaned and carefully prepared before the new filling is placed. If the decay was near the nerve of the tooth, she will apply a special medication for added protection. The composite filling will then be precisely placed, shaped, and polished, restoring your tooth to its original shape and function. A crown procedure usually requires two appointments. After anesthetizing Dr. Seth will remove all areas of decay, Dr Seth will take several highly accurate impressions of the teeth to be crowned and send it to a dental laboratory to create the custom crown. 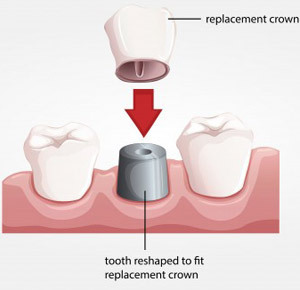 A mold will also be used to create a temporary crown which will stay on your tooth for approximately 2-3 weeks until your new crown is fabricated by a dental lab. 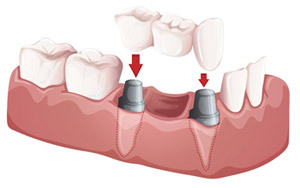 At your second appointment your temporary crown will be removed, the tooth will be cleaned, and your new crown will be carefully placed to ensure the spacing and bite are accurate. Dr. Seth will evaluate your case and help you determine the type of crown that is best suited for your needs. Dental crowns –Porcelain or Gold provide a beautiful restoration and long lasting protection.Dr. Seth will give post care instructions and encourage you to have regular dental visits to check your new crown. All of your teeth play an important role in speaking, chewing and in maintaining proper alignment of other teeth. Patients who are missing a tooth or several teeth may experience difficulty chewing and speaking, dental shifts, and an undesirable sunken facial appearance. In addition, missing teeth can eventually lead to jaw and joint problems that are costly to treat. Tooth loss doesn’t necessarily have to occur as you age, but if you do lose teeth, they must be replaced to maintain proper function of your mouth. A bridge is comprised of one or more artificial teeth, attached to a dental crown on either side of the space. Dental bridges are a conservative way to prevent further shifting of your remaining teeth by stabilizing them and preventing further damage and bone loss.